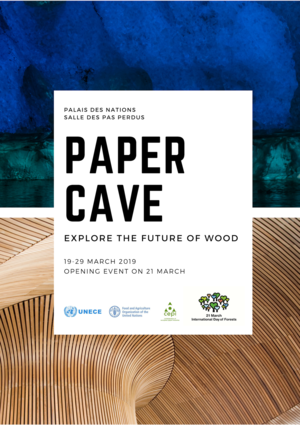 From 19 - 29 March, in the Salle des Pas Perdus of the Palais des Nations, visitors had the chance to explore the future of wood! The Paper Cave exhibition showcased innovative wood-derived products of the future: printed electronics on a greeting card, cutlery from wooden fibers which can be recycled up to 7 times, a ventilation system for airplanes which is made out of cardboard, stronger than spider silk biobased material which consists of nanosized cellulose fibres and innovative packaging materials made from post-consumer waste such as used coffee cups. These products of the future can help to address major challenges society faces such as raw materials depletion, climate change, and plastic pollution. “The forest industries are paving the way for a healthier and more sustainable future”, said Bernard De Galembert, Innovation and Bioeconomy Director of the Confederation of European Paper Industries, “we must leave the oil age and firmly step into the age of fibre”. UN Deputy Secretary General, Amina J. Mohammed, toured the paper cave during the International Day of Forests in Geneva. Read more. PEFC, the Programme for the Endorsement of Forest Certification, combines learning and entertainment in its new project: Humans of the Forests. The video series portrays people around the globe who are in touch with timber and forests in their daily lives, and shows what forests mean to them. The first videos of the series take us to the Italian village Campi di Norcia, which was destroyed by an earthquake in 2016, and to the forest that will give it new life. We meet Anna, a forest manager in Northern Italy, who donated the timber from her forest for the reconstruction of the village, and Roberto, who lost his home in the earthquake and is determined to rebuild Campi di Norcia with PEFC-certified wood. A Forest Breakfast, Arts & Crafts and a Quiz to celebrate International Day of Forests 2019! Register here: Registration is closed. 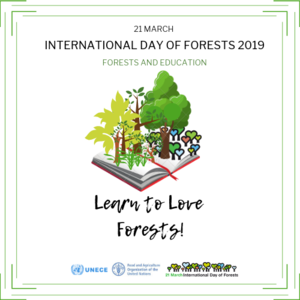 The International Day of Forests 2019 was celebrated on 21 March 2019 under the theme “Learn to Love Forests”. It underscored the importance of forestry education at all levels in achieving sustainable forest management and biodiversity conservation. Healthy forests mean healthy, resilient communities and prosperous economies. Moreover, forest education is crucial to prevent the alienation between humans and the environment, sensitize society towards a more sustainable lifestyle and to integrate environmental issues into pedagogy. Humans depend on the natural environment. In order to protect it properly, it is important we all know about the importance of trees and forests. As more people live in cities and become increasingly disconnected from nature, it is nowadays more essential than ever to foster a better understanding and awareness of forests and their benefits to society, especially among children at an early age. 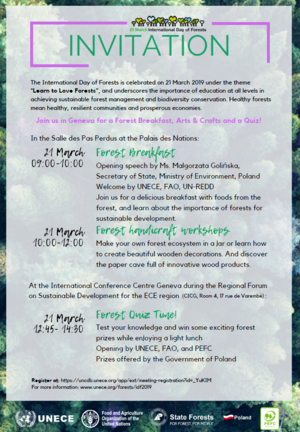 The 2019 celebration of the International Day of Forests focused on Forests and Education and saw a range of activities in Geneva including a Forest Quiz and an exhibition on the innovative capabilities of forest products. Find the programme with details about the day's events here (pdf), and get inspired with the key messages of the IDF 2019 (pdf). The theme of International Day of Forests is decided by the Collaborative Partnership on Forests (pdf). How much do you know about forests? - Find out by joining the Forest Quiz on the International Day of Forests 21 March 2019, 12:45-14:30, in the International Conference Centre Geneva (CICG). Participants formed small groups to answer the quiz master's questions. The fastest correct answer won - Polish forest prizes were given to the winning teams. Feel free to contact Leonie Meier or Theresa Loeffler for more information.